The Tampa Bay area is home to over 2 million residents lured by sunny beaches and bright futures. It's where Tampa Bay Buccaneers' fans cheered their winning team to a Super Bowl victory in 2002 and the Tampa Bay Lightning to the 2004 NHL Stanley Cup Championship. It's also home to the Lowry Park Zoo which has been called the "Number 1 zoo in the United States for kids." Tampa has the largest performing arts center in the southeast and the largest science museum in the south. In addition, the cultural arts district in downtown Tampa is expanding every day, with the recent addition of the Patel Conservatory which helps both young and mature actors, artists, musicians and performers perfect their craft. It's one of the few markets in America with two major metropolitan newspapers, The Tampa Tribune and St. Petersburg Times. Tampa International Airport is the #1 ranked airport in the country and Tampa is the only city in America that celebrates the glory of being a pirate with all of the festivities that Gasparilla offers during one whole month (February) each year. If you're looking for a great way of life, it doesn't get better than Tampa Bay. There's no state income tax, low property taxes and Tampa offers a lower cost of living than other major southern cities, including Atlanta, Orlando, Charlotte and Charleston. As a region, the commitment to excellence in education is impressive and is essential for providing an educated, talented workforce for area businesses. Tampa is also one of the most literate cities in America, ranking 16th in the country among cities with more than 250,000 residents. It's a region that attracts millions of tourists each year, who appreciate its mild winter climates, tropical summers, spectacular sunsets and beautiful beaches. To those of us who choose to live here, these are every day pleasures - not just vacation moments. We go fishing before heading into the office, we walk on the beach at sunset, we enjoy wearing shorts in January and we are thankful, with each and every sunny day, to have made the decision to live in Tampa Bay! We have a healthy economy, as well as some of the best health care facilities in the United States, including H. Lee Moffitt Cancer Center and Research Institute, two trauma centers, a medical school (which works in conjunction with two major hospitals) and three hospitals ranked as "America's Best Hospitals" by U.S. News and World Report. Like most Americans, the residents of Tampa Bay are proud of the men and women who serve in the military and we're honored that MacDill Air Force Base is located here in Tampa. It's the headquarters for two major commands; special U.S. Operations Command and U.S. Central Command. And it's also where Coalition Village is located, comprised of representatives from 65 nations who are working together to combat terrorism. 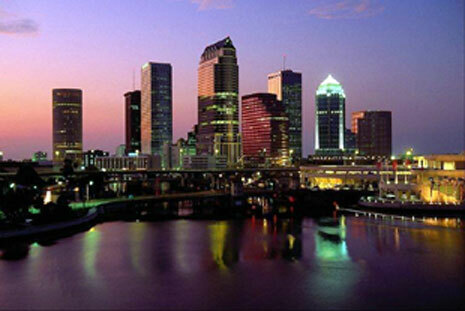 If you're looking for a place to start or grow your business, Tampa Bay is right for you. In 2004, Florida was ranked #2 as one of the best places in America for start-ups and more and more companies are also relocating their headquarters to Tampa as well. We're the west coast anchor of Florida's High Tech Corridor and you'll find all the logistical resources needed for import/export through Florida's largest deep-water port, conveniently located in downtown Tampa. You can also take advantage of the five major cruise lines that sail out of the Port of Tampa. You can choose to live in a historic bungalow - or a high rise by the Bay. You might live in a country club community - or a lakeside villa might be right for you. 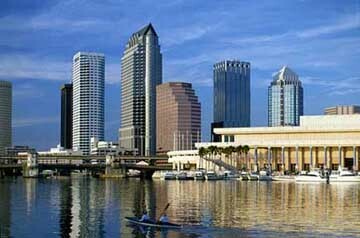 Tampa Bay has a wide range of residential choices to fit every budget and lifestyle. Just remember, the sunshine, sunsets and gulf breezes are free!